The salty waters of the Gulf. Mild sunny days. Thunderstorms. Food trucks. A suburb that looks like Venice. These were all things I was not expecting to experience in the middle of the desert, but Doha side-stepped my expectations in the most magical way. Qatar's cooler months offer so many activities and opportunities for interested travellers, from water sports to food festivals, art exhibitions and outdoor events. If you find yourself visiting in March and April, you can really make the most of Doha's attractions and explore the city in an entirely different way (no air conditioning required). This seaside promenade is a great spot to spend a lazy afternoon. You can meander along while admiring the skyline, stop for coffee and people watching, or take a picnic basket and grab a spot under a tree at a nearby park. It is very popular with families, so if the weather's good, make sure you get there early to avoid the crowds. In the evenings, the dhows (boats) that hug the bay light up with colourful lights, becoming single-vessel disco parties set against the skyscraper-dotted skyline. Cafés, like the one at the Museum of Islamic Art, stay open until almost midnight, so you can find some sustenance too if you prefer a night time walk. If you follow the racing world, you'll probably have caught glimpses of the race that usually opens the motor sport season. Losail International Circuit lies a short drive outside Doha, so if you're up for it, I suggest bringing ear plugs. TV doesn't do it justice... those bikes are loud. The grandstand offers direct views of the circuit's start straight and team garages (I could see straight into Rossi's!). If you want to catch all the overtaking on the corners, consider getting there early to grab seating across from a screen or in the higher tiers, so you can see the further reaches of the track. The annual Qatar International Food Festival was one of the highlights of my trip, combining so many things I love (food, nature, food, awesome views, food, cool architecture, food) in one week-long party. In addition to the main venue at Doha's stunning Museum of Islamic Art, the 2016 edition included the Pearl and Katara Cultural Village as satellite spots. Every venue had its own style of meals on offer, from food trucks to health bites, gourmet options and Qatari street food. You could visit a different venue every day, if you wanted to, and try all the different treats on offer (no prizes for guessing that this is what I did). 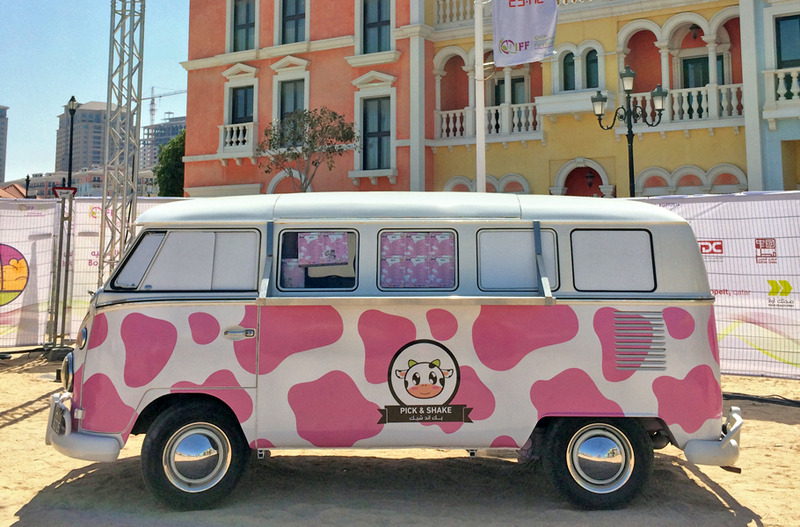 Hosting food trucks at The Pearl's Qanat Quartier was a smart move on behalf of Festival organisers. The Venetian-style suburb completely stole my heart. After becoming accustomed to Qatar's mostly blue-and-sand coloured landscape, the gorgeous pastel buildings were an even more beautiful sight. Can I have a pink house, please? On the food front, I was able to find vegetarian options at all three venues, happily devouring everything from falafel wraps and strawberry cheesecake ice cream to chickpea curry and deluxe milkshakes. The main exhibition at the Museum had the best selection - including a health food section, a Mexican restaurant serving "no meato burritos" and a stall by Qatar's first vegan restaurant. Many of the fancier hotels have small stalls too, allowing you to sample their cuisine without having to pay for a full sit-down meal. I've mentioned Doha's plethora of sweet options before, and while Sugar and Spice and Chac'Late are still high on my must-faceplant list, there is a new entrant: Magnolia Bakery. The New York staple has two stores in Doha, offering their standard cupcake options alongside other treats like muffins, pancakes and surprisingly good coffee. While the intention was to visit for breakfast and perhaps take away a cupcake or two, we went to the Ezdan Mall branch, which doesn't serve any cooked savory meals and is all about the sugary baked goods. Of course, this was the worst thing to happen to me ever (gosh) and we decided to eat pancakes for breakfast instead (the horror). I had the incredibly fluffy and delicious traditional pancakes, while my breakfast date had a ridiculous-looking red velvet stack topped with cream cheese. With gorgeous blue crockery, a cute penny-tile floor and people-watching opportunities, it's a great little spot to stop for some sweetness, especially if you're craving Western treats or celebrating something special. Spring is a great time to try some of Doha's outdoor and water sports, as it's warm and sunny, but not as humid as the more extreme summer months. If you head North from Doha for about 45 minutes, you can visit the Al Thakira mangroves just outside the town of Al Khor. The area is popular for fishing, jet skiing and paddling, and includes a reserve offering bird and fish-spotting opportunities in the clear waters of the Gulf. If you're up for a light workout, companies like Aqua Sports Qatar offer guided paddling tours. These allow you to see the mangroves up close and watch for flamingos from a kayak or stand-up paddle board. The sunset option is a stunning one, as you can navigate the water channels in soft afternoon light and head home with pink skies. The landscaped beauty of Sheraton Park is definitely worth a visit if you need to escape the sand and concrete and spend some time around flowers and trees. Located on one end of the Corniche, the fantastical park is filled with walking routes, fountains, a play area and impossibly green grass. There's even a rock-n-roll fountain that rhythmically spurts water on to drum cymbals. Yes, really. The paths of the park are often filled with skateboarders and cyclists, but are wide enough to accommodate runners looking for views along their route. If you're looking for a slower pace, there are reading or picnic spots too. So it's Friday evening and you've got nothing to do? You should investigate this seasonal live music night, set under fairy lights and complete with benches near the waters of West Bay. Set in the gardens behind the Sheraton Hotel, the Backyard offers BBQ style eats and comfy carpets and beanbag chairs under the trees. Held in Qatar's cooler months, the picnic-style event allows you to lounge around eating popcorn or sip a cocktail while you listen to the DJs and bands that take to the stage. While it's a bit on the pricey side if you're traveling on a weaker currency, the setting and atmosphere make for a lovely evening. Vegetarians be warned: most of the food options are centered on meat, so you'll have to request a special order (like a cheeseburger without the patty) unless you're keen to fill up on fries, salad or popcorn. On Saturday afternoons and evenings, the park in front of the Museum of Islamic Art becomes a mini market place, selling everything from hand made crafts to food, art, clothes and souvenirs. It's a great place to sample some delicious regional food without breaking the bank. I tried Arabic sweets, Mississippi mud pie, mint lemonade and the most incredible falafel wrap that may have ever existed. While you're in the area, you can visit the Museum itself, or the nearby Al Riwaq Art Gallery, which hosts regular exhibitions from artists around the world. Bonus: travel with me video!